If bagels are a New York thing, San Francisco definitely has sourdough. 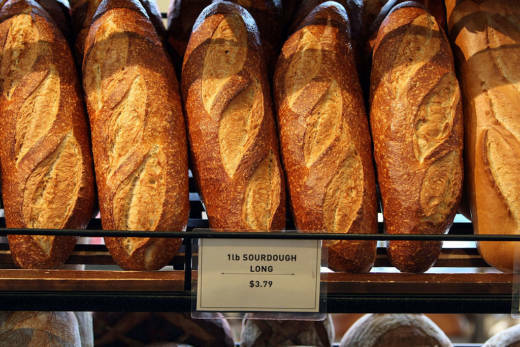 And probably no one has convinced more people that our sourdough is unique than Boudin Bakery, where tourists line up at Fisherman's Wharf for a taste of that moist-tangy, fogbound delight. "What makes San Francisco sourdough so unique?" Here at KQED, we've always heard there’s something in the water or the air that makes our sourdough special. But is that really true? It turns out that this is as much a science question as it is about the history and local mythology of our "authentic" local sourdough. By the time I had the answer, I also had 2 pounds of smelly homemade sourdough starter fermenting at home, and the results of a lab test that described the microbes living in it. To understand what makes our bread taste the way it does, you need to know how bread gets started. 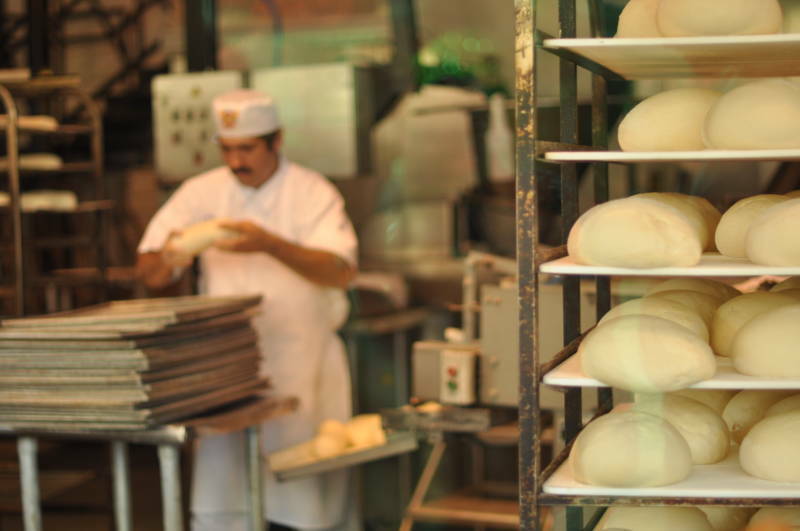 My investigation began in the fermentation room at Semifreddi’s bakery in Alameda, one of the best-known local producers of sourdough, along with Acme Bread Company and Tartine Bakery. The fermentation room is the inner sanctum of the bakery. It's a very cold, stainless-steel vault where 300 yellow buckets brim with slow-bubbling beige goop: future sourdough. I stood there, shivering in a hairnet, with co-owner Mike Rose and head baker John Tredgold. Rose is a soft-spoken man who talks about sourdough with wonderment, as if it's alive -- which it is, with millions of microbes. "Can you hear it? It’s hungry," Rose said. "It will be fed later today. It gets fed once a day. Equal parts flour and water." Before sourdough gets baked, it has to be grown. Born as a primordial glop, aptly called starter. All it needs to grow, as Rose said, is flour and water. And time. That's it. If you add anything else, it's not real sourdough. Eventually, the sugars in the flour start to break down, and fermentation happens on its own. Tredgold handed me a plastic spoon and pointed me to a bucket. I could see bubbles rising to the surface of the bucket -- a sure sign of microbial activity. The starter tasted like very sour yogurt to me, but Tredgold treated the experience like tasting a fine wine, smelling and savoring. "This is more like creme fraiche," he said. "It makes you salivate, it makes you excited to eat more." Semifreddi's produces 9,500 loaves of sourdough each day. But no two loaves taste exactly alike. And that’s because the starter is alive with millions of wild yeast cells and naturally occurring bacteria. The yeast makes the bread rise. And the bacteria create the acids that make the bread sour. The flavors vary from day to day, and batch to batch. Sourdough is one of the most ancient breads, dating back at least 5,000 years. It's reasonably easy to create a starter from scratch, but tricky to master the triple arts of crust, crumb and flavor when baking. So much depends on capturing enough wild yeast to make the bread light and airy. (Adding commercial yeast is not a permitted technique at the baking stage if the goal is authentic, old-fashioned sourdough). "We try to control it by temperature and time. And our hands. It’s never fully totally under control, because we’re dealing with natural organisms," said Rose. "I love it," he added with a grin. 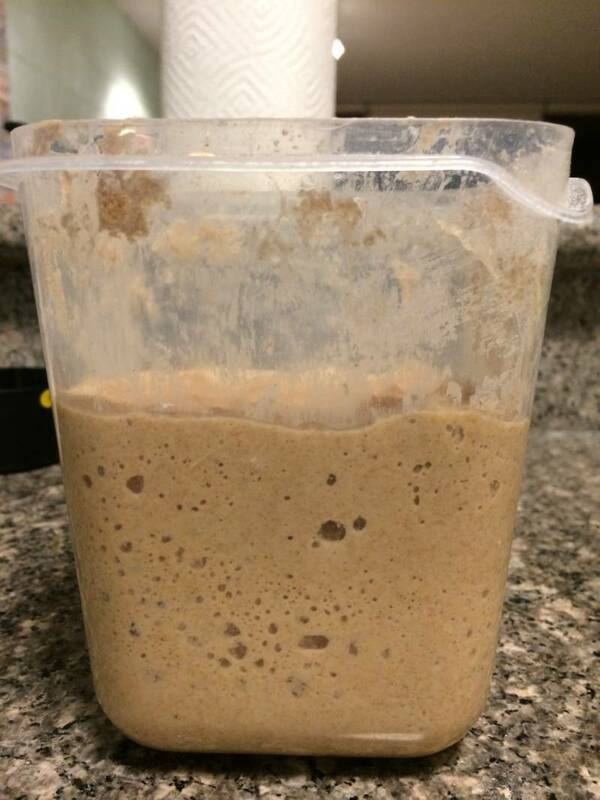 Rose was so passionate that I decided to try growing my own sourdough starter at home (more on that below). A little voice nagged at me, though. Anyone can make sourdough, but would it be authentic if it wasn’t born in San Francisco? (I live in Oakland). 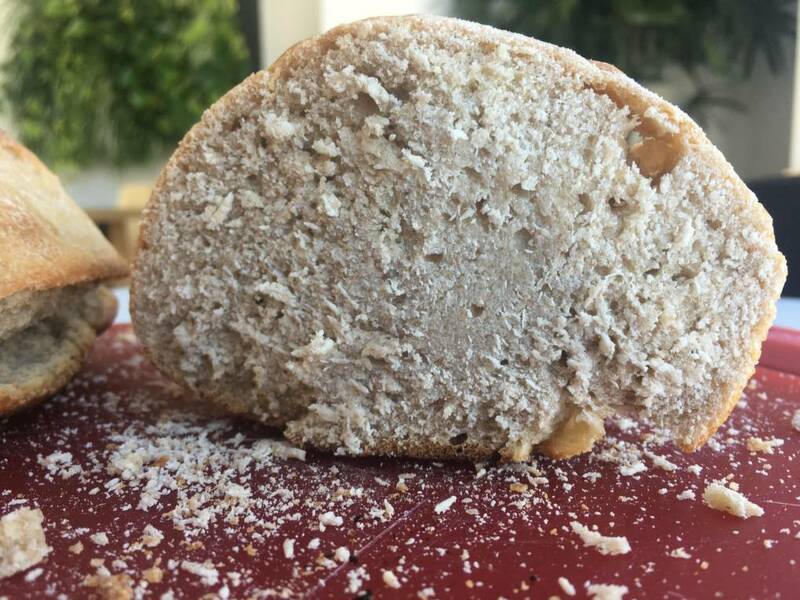 No one has convinced more people about the unique qualities of San Francisco sourdough than Boudin, which says it’s been selling the same loaf of bread for 168 years. According to the Boudin Bakery museum at Fisherman’s Wharf, the company’s mother dough follows an unbroken line back to the Gold Rush in 1849. Louise Boudin even saved the starter from a burning building in the 1906 earthquake. A museum docent told me the starter is so special and irreplaceable that the Boudin mothership sends its retail stores fresh starter every 23 days. Without it, they say the sourdough those stores produce would stop tasting like San Francisco sourdough and start tasting like San Diego or Sacramento sourdough. Why? Well, according to the museum, Boudin bread owes its special flavor to a strain of bacteria that thrives only in San Francisco’s climate. Scientists identified it here in 1970, so they named it Lactobacillus sanfranciscensis. It’s a great story. Too bad it’s not quite true. 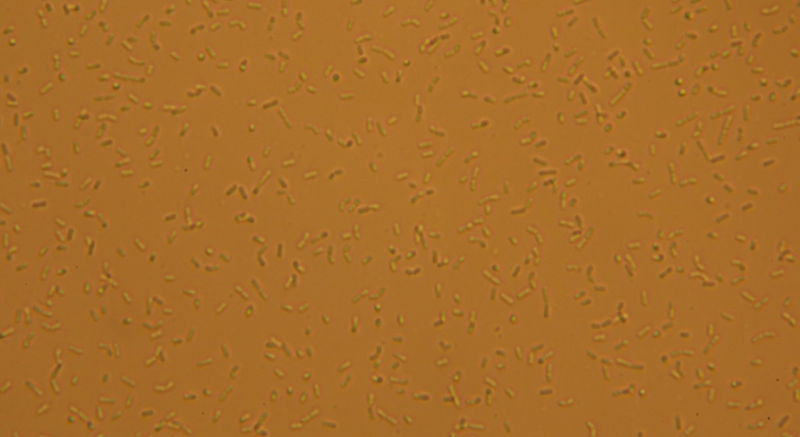 Scientists did identify Lactobacillus sanfranciscensis here. But recent studies have found it in up to 90 percent of countries where sourdough is produced. So from a biological standpoint, San Francisco sourdough is not all that distinctive. "It’s something that everyone thinks is unique to San Francisco and that is not true at all," said Ben Wolfe, a microbiologist at Tufts University in Boston. 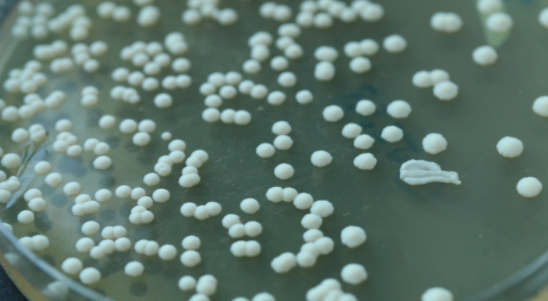 His lab studies fermentation full time … including the microbes you find in sourdough. So, case closed? Not quite. Science is still learning about the lactic acid bacteria (like L. sanfranciscensis) that give sourdough its main sour flavor. Other fermented foods have lactic acids, too, like miso, yogurt and kimchi. But scientists don’t know where they come from. Or how they get into your sourdough starter when you make it in your kitchen. One explanation is that the bacteria could be in the flour to begin with. So when you go to the store and buy a bag of flour, it’s not sterile. They could also be on your skin or floating around your kitchen, but Wolfe says those are less likely to become the dominant bacteria in your starter. "This is one of the big questions we’re trying to answer in our story of American sourdough: Where are the lactic acid bacteria coming from?" said Wolfe. There’s never been a large-scale study in home kitchens to really identify the sources of bacteria at home. Wolfe’s lab has partnered with the Rob Dunn Lab at North Carolina State University on the Sourdough Project, the first comprehensive effort to test the DNA of sourdough starters across America -- and understand the evolutionary biology that underlies the differences among starters. The Sourdough Project is soliciting hundreds of sourdough starter samples from amateur and professional bread bakers across the country. (To participate in this public science project, get started by filling out this questionnaire). Scientists will analyze samples to answer the baseline question: How variable are the microbes from region to region? And how much variability can be attributed to the grain of the bread, versus the air, the water or the humans involved? There are so many factors. Wolfe ticks them off. "It could be the time that people ferment their breads. It could be the temperature. It could be a special set of recipes used in San Francisco than in other places." When I told him I was growing my own sourdough starter, he offered to analyze it. So while science may yet discover something special is lurking in our sourdough, Wolfe isn't holding his breath. Not even the bakers at Semifreddi's, a company that has been in a position to benefit from the reputation of local sourdough, embrace the cachet. Semifreddi's head baker Tredgold says it's pure marketing. "It sells the city. It’s one of the things the city’s known for. The bridge, the bay, the sourdough." And Rose, the co-owner of the bakery, added: "If we take our local starter and bake with it in Los Angeles, I think it will taste very similar to what we’re making here," he said. Blasphemy! But possibly ... true. My own sourdough experiment lasted more than a month. I used King Arthur whole wheat flour and kept my mixture on the kitchen counter. As it grew, it smelled distressingly like vomit before it mellowed. At one point it almost spilled out of the Tupperware I’d been keeping it in. I don't have pets or children, so I took photos of my starter's regular maturity and forced my friends to admire them. But the most important question was: How did it taste? 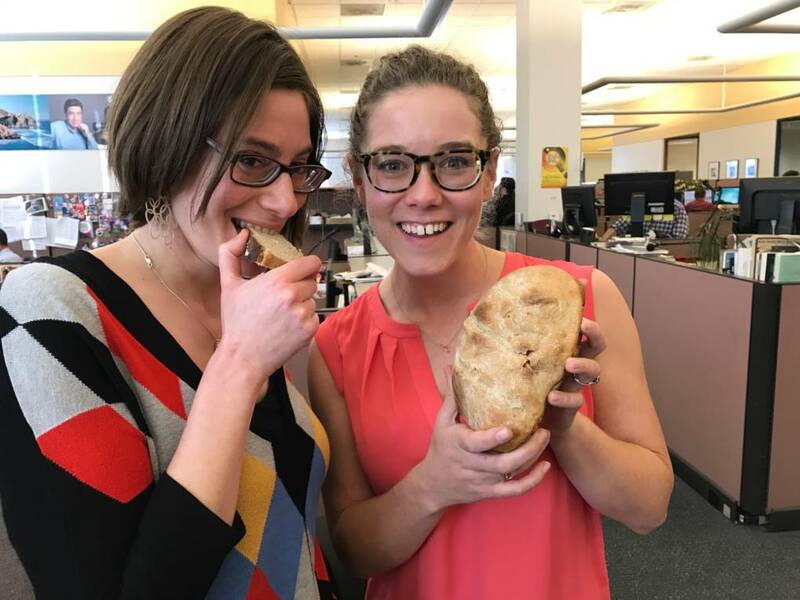 I baked two little loaves and brought them into the KQED newsroom to get some brutally honest feedback from fellow reporters. Being a first-time baker, you can imagine how this went. The loaves were so dense they had almost no air pockets. They weighed at least 3 pounds and were nearly rock-hard. My colleagues at KQED charitably praised the taste, but it was clear something had gone wrong in the baking process ... or with the starter itself. A few weeks later, I got my sourdough DNA results back from Ben Wolfe's Tufts lab. My starter had two bacterial species: Lactobacillus brevis and Lactobacillus plantarum; and one yeast species: Wickerhamomyces anomalus. All of which are very commonly found in sourdough starters made around the world, according to Wolfe. It's also common to have no more than a few species of yeast and bacteria in any given starter. But that one bacterium once believed to make our bread so special -- Lactobacillus sanfranciscensis? My bread didn’t have any. Would things have gone differently if it had shown up? I may never know.